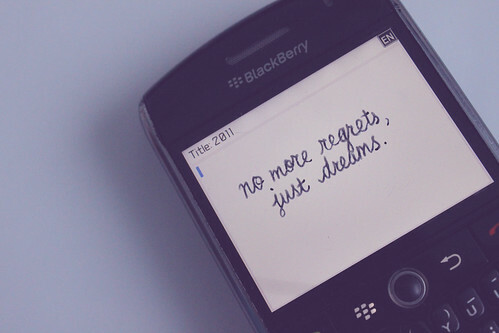 189/365 No More Regrets, Just Dreams, originally uploaded by jaaanet ♫. I have spent far too much time in the past few years going over and over and over all the things I’ve done wrong. Combing through the skeletons in my closet and beating myself with them. I have scoured my innermost thoughts so harshly I am raw within. It is time to move forward. I see I am not perfect. I know I have hurt people unintentionally. I know I have made poor choices I am not proud of but now it is time to take a mental photograph and leave this guilt behind. I will add these memories, these experiences to a much larger, much greater sum total of memories and experiences and see myself just a little bit more colorful because of them. We are a collection of thoughts, moments, people, experiences. And I am learning to be ok with who I am. I will hold the door for people behind me. I will say “please” and “thank you.” I will smile at strangers. I will compliment people. If I’m not sure whether I should greet someone with a handshake or hug, I will opt for the hug. If I see someone having trouble, I will offer help. I will try to perform at least one Random Act of Kindness a week. I will be grateful. I will not hold grudges. I will always do my best to be humble, empathetic, and honest. I will be mindful and considerate of the people around me. I will be kind to people, animals, and nature. All in all, I promise to be nicer!